If you’re a southern grasshopper mouse, nothing beats a delicious snack of scorpion. But what, you might ask, prevents that from being a painful or even fatal event? Well, this native of the Arizona desert has evolved an amazing resistance to the stings of the bark scorpion—stings so painful and toxic they kill house mice and other rodents of similar size. Why am I sharing this bit of natural history? Well, it turns out that by studying the grasshopper mouse and its unusual diet, NIH-funded researchers at the Indiana University School of Medicine and collaborators at the University of Texas, Austin, have identified a new target on nerve fibers that could lead to more effective and less addictive pain medications for humans. The key to the grasshopper mouse’s pain resistance lies in two proteins—called Nav 1.7 and Nav 1.8—that sit on special sensory nerve fibers, called nociceptors. When a scorpion stings a house mouse, its venom activates Nav 1.7, which triggers an intense pain signal through the nerve fiber. In grasshopper mice, scorpion venom activates Nav.1.7, but it also activates Nav 1.8, which overrides the pain signal from Nav 1.7. 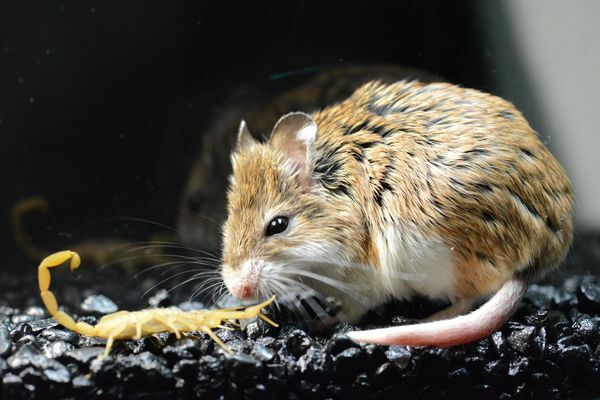 So, rather than causing pain in grasshopper mice, scorpion venom actually halts it! Though the Nav 1.8 protein in the house mouse and the grasshopper mouse differ in a number of ways, the researchers were able to show that the immunity from pain after a scorpion sting is attributable to just a single amino acid difference. This tiny change is apparently enough to block pain—and enough to point biomedical researchers in a tantalizing new direction in their quest to find better ways to ease human pain and suffering. Voltage-gated sodium channel in grasshopper mice defends against bark scorpion toxin. Rowe AH, Xiao Y, Rowe MP, Cummins TR, Zakon HH. Science. 2013 Oct 25;342(6157):441-6. Great read, learned a lot.